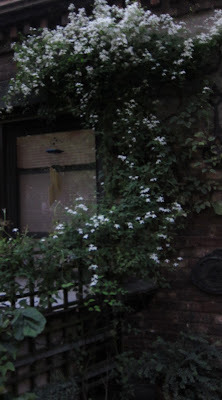 The blooming of my Clematis paniculata in my urban garden, is in full swing; the vine and its flowers are playfully wrapping around Juan's Installation as evidenced in the image posted above this entry. The precious delicate flowers against the rough brick provide a legacy to Donna, the grower from Cheerful Cherry Farms (whom I posted about in an earlier post). Donna sold me the Clematis paniculata plants a couple of years prior on that hot May morning, when she wore a wool cap and winter coat. I say legacy, because a few weeks ago I went down to Union Square (USQ) to tell Donna about the growth of my Clematis paiculata, but I only saw her husband, Jim.It was unusual not to see her with him, and I suspected that something had happened to her, but I said nothing. Recently I returned to USQ again, and Donna still was not there. This time I asked Jim about her. He told me that she had been very sick and had died. He remarked that I must have noticed that she had worn a wool coat and hat on days when the temperatures had been very hot. Evidently she'd been quite ill for a long time, and her husband had even suggested that she not make the trip from the nursery to vend at USQ. He laughed when I told him what she had said about my eyesight. 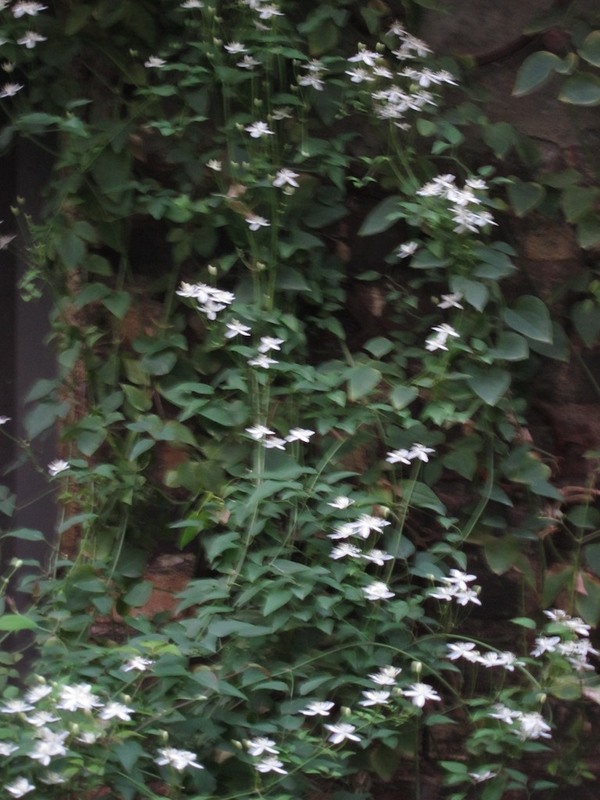 She was a real 'diamond in the rough' and I think of her in the morning when I water my garden - Donna, the diamond in the rough, like my delicate Clematis paniculata flowers climbing about the rusty trivets that Juan so carefully placed on my tattered brick wall.